Ships tomorrow if you order in the next 17 hours 39 minutes. Ancient Minerals Magnesium Lotion Goodnight from Enviromedica is a smooth, quickly absorbed emulsion of magnesium, MSM and melatonin in a skin-nourishing base of certified organic oils. While it is best known for being responsible for maintaining sleep, melatonin may also serve as a potent free radical scavenger that can easily cross cell membranes. However, our body's production of melatonin may decrease as we age. 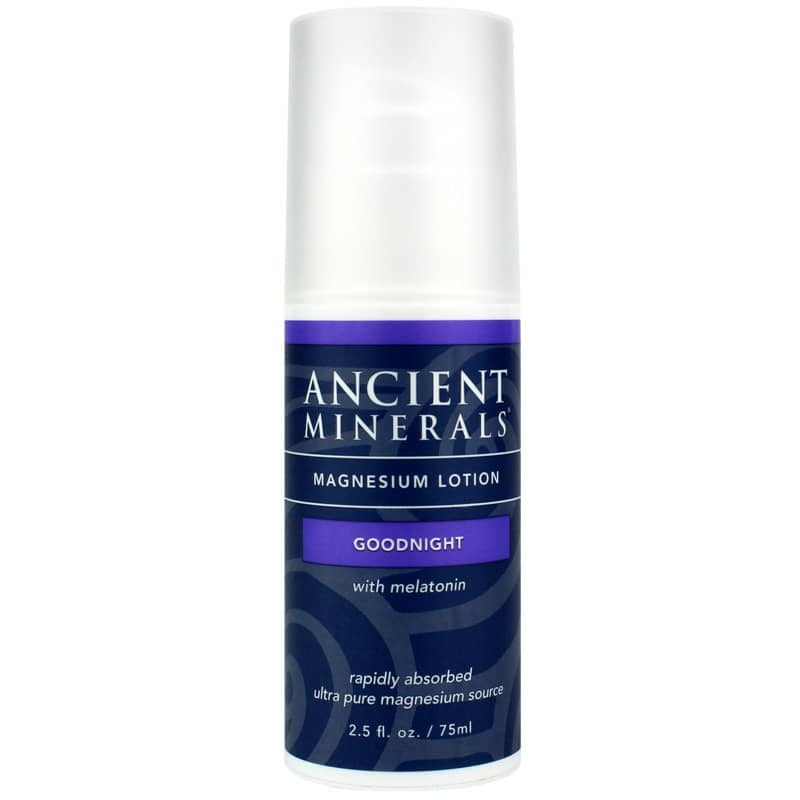 This magnesium lotion is rich in plant moisturizers, including coconut oil and shea butter, to soothe and hydrate your skin without leaving it feeling waxy or greasy. Rub 1ml, or one full press of the pump, thoroughly into your clean skin once a day, or as needed. People with sensitive skin may wish to begin with a 1/2 pump and gradually work up to 1ml. This formula provides 3mg of melatonin and 25mg of elemental magnesium per 1 ml. Adults: Rub 1ml (1 full press of the pump) thoroughly into clean skin, once daily, or as needed. Sensitive individuals may want to start with 1/2 pump and gradually work up to 1ml. Contains 3mg melatonin and 25mg elemental magnesium per 1 mL. I like the lotion absorption rather than GI digestion. But, I didn't notice a difference and it burned with each application. I love this product. Originally prescribed for my dog's arthritis, I decided to try it. Wow!! It really works! I apply to feet and my dog at night, so we both have a great nights sleep. My eye twitches also have gone away. pretty sure I'll be using this for life. A clean product that does what it says it will do. The magnesium plus melatonin in this form works better than pills, faster too. I strongly recommend it.